Chester MP Chris Matheson has pledged his support for plans for a new community sports hub in the city. The Labour MP is backing Chester FC Community Trust’s proposed £1.6 million King George V Sports Hub in Blacon. The exciting scheme will transform underused playing fields to create a thriving sports hub including a floodlit 3G pitch, improved grass pitches and new clubhouse with changing rooms and community facilities, subject to planning. Grassroots clubs and leagues will be able to use the new facilities while the proposals will deliver wider community benefits too, including improved health and wellbeing and new employment and education opportunities. Mr Matheson said: “I have supported this project from the moment I first about it, and I want to pay tribute to the team that has worked so hard to make it a reality. The Community Trust is working with Cheshire West & Chester Council to develop the sports hub with the charity aiming to raise £300,000 through public donations, fundraising events and working with local businesses to bring the plans to fruition. 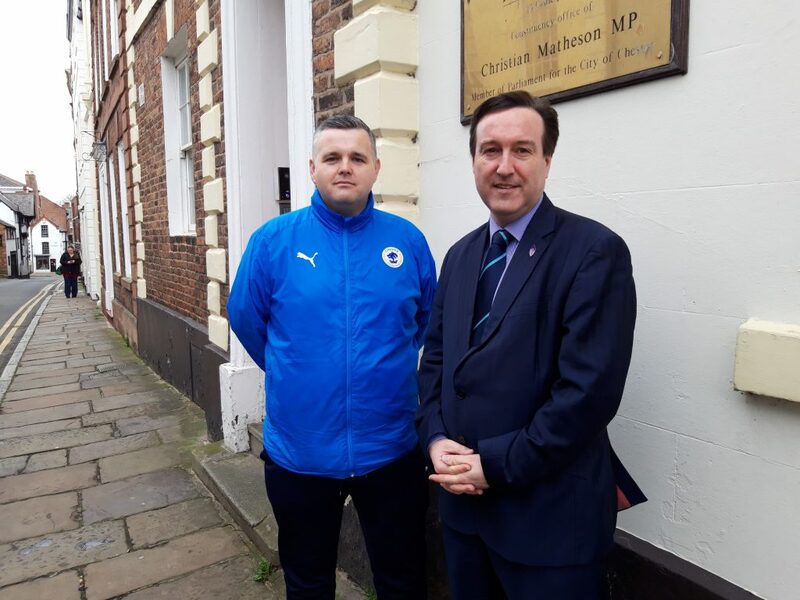 Jim Green, chief executive of Chester FC Community Trust, said: “We are delighted to have the support of our MP and are grateful for his help in bringing the scheme forward. Donations to the project can be made at www.justgiving.com/campaign/kgvsportshub and a new dedicated website has been launched at www.kgvsportshub.co.uk. If you would like to know more about the plans, have any questions or would like to be involved in the project, please contact Community Trust chief executive Jim Green on 01244 371376 or email jim.green@chesterfc.com.